This Halloween costume’s journey started with a moving box, duck tape and popcorn.. lots and lots of it! This is probably one of the easiest but coolest costumes to make! All you need to do is cut out a hole at the top of box, and then grab your red and white duck tape and start taping down the sides. I did a bit of Google searching to find the perfect popcorn logo. My wonderful hubby blew it up, got it laminated and we glued it onto the front and back of the box. The next part of the journey was to start eating the popcorn..oops.. I mean gluing the popcorn :) My 8 year old daughter had a great time popping the popcorn and sneaking in popcorn into her mouth. At this point, I discovered my new best friend – the spray adhesive glue! That stuff works wonders!! Just spray and press the popcorn on top. I learned that stale popcorn works the best (it’s not so crumbly).The hardest part was probably the hat! The spray adhesive did the trick for the most part but not always. I had to turn to my trusty glue gun to finish off the job. Then, the transformation was complete! It was a bit of a drizzly night here on Halloween. Amazingly her costume held-up thanks to the duck tape and the neatest thing was the rain somehow triggered the popcorn smell! 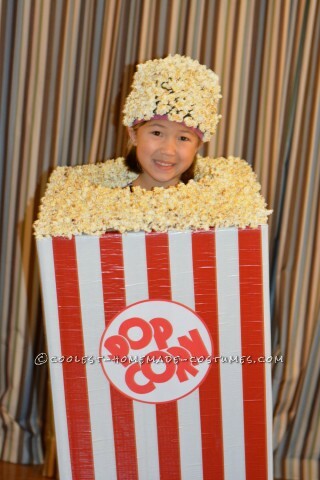 So, she not only looked good but smelled good too as the popcorn scent wafted around her! Yum!